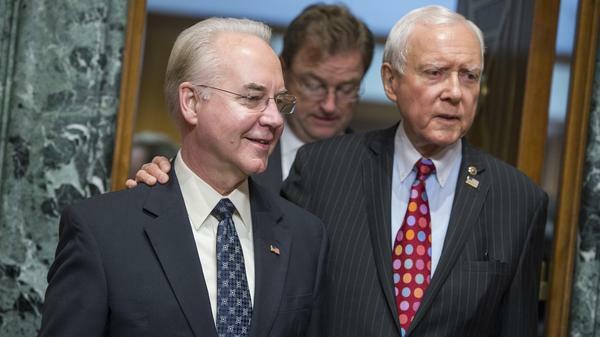 Rep. Tom Price, R-Ga., center, nominee for Health and Human Services secretary, is seen with Chairman Orrin Hatch, R-Utah, before his Senate Finance Committee confirmation hearing on Jan. 24. A day after Democrats on the Senate Finance Committee boycotted votes to advance the nominations for President Trump's nominees to lead the departments of the Treasury and Health and Human Services, the panel's Republicans met in a surprise meeting Wednesday morning and voted to suspend committee rules to vote on those nominees without Democrats present. Sen. Orrin Hatch, R-Utah, the chairman of the Finance Committee called the Democrats' boycott "the most pathetic thing." Opening the meeting, Hatch said, "We took some unprecedented actions today due to the unprecedented obstruction on the part of our colleagues." Democrats consider the move in violation of longstanding rules on the finance committee, which require one member of each party present. Sen. Sherrod Brown, D-Ohio, posted a photo of empty seats in the committee room and said the Democrats were standing with people "hurt by the abusive practices of Mnuchin's bank." Hatch defended both nominees this morning. "Dr. Price's account of the investment hasn't really been substantially refuted, let alone disproven. But, my colleagues claim that their misinterpretation of his testimony is grounds for an indefinite delay on his confirmation," he said. Hatch also said the Mnuchin controversy is moot because there is "no fixed definition" of robo-signing. Consumer advocates and the financial services industry have differing views on the term. Democrats have insisted that their issue with these nominees is strictly the issues they've raised, though Hatch accused them of being "ready to leap off whatever cliff" that Senate Minority Leader Chuck Schumer asks them to. Schumer broke with time-honored Senate decorum yesterday by voting against Elaine Chao, the wife of Senate Majority Leader Mitch McConnell, for Transportation Secretary. She was approved 93-6. The minority party, with virtually no legislative power to block Trump Cabinet nominees as was illustrated this morning, is under pressure from liberal voters to do whatever they possibly can to stop Trump's nominees from being approved. Democrats did stage another boycott against the committee vote for Trump's pick to lead the Environmental Protection Agency, Scott Pruitt, who sued the agency over Obama-era regulations as Oklahoma Attorney General and has expressed skepticism of climate change. That vote was supposed to occur Wednesday morning in the Senate Environment and Public Works Committee. GOP committee chairman Sen. John Barrasso, R-Wyo., called the move "political theater," and said there would not be a vote today, declining to force a vote in the way Hatch did. He also said Democrats were simply stalling because they don't like Pruitt's views. Sen. Tom Carper, D-Del., said he didn't like that Pruitt would not definitively say whether he'd recuse himself from the lawsuit by the State of Oklahoma that he had filed as attorney general against the EPA if he were leading the agency. The real fight could come now with Trump's nomination of a Supreme Court justice. Federal Judge Neil Gorsuch will need 60 votes to clear a procedural hurdle needed for confirmation. That threshold was removed for lower court nominees and cabinet positions in 2013. While the Democrats boycotted the Price and Mnuchin committee votes, they did allow other panels to move ahead on Trump nominees including Betsy DeVos for education secretary, Rick Perry for energy secretary and Ryan Zinke for interior secretary. Democrats have delayed the final floor vote on Trump's nominee for secretary of state, but Rex Tillerson was set to be confirmed Wednesday afternoon.